Is your retired racing Greyhound’s girlish or boyish figure going to pot from taking this couch potato thing too seriously? Has the time come to start the battle of the bulge? Be objective. Look at your dog: Does it have a nice tucked up abdomen? Feel your dog. Can you feel the outline of the ribs, especially toward the stomach? Some people observe the “Three-Rib Rule.” If you can see three ribs on a Greyhound, the dog is at about the right weight. If you adopted your Greyhound hot off the track, most likely it was a tad on the thin side for a pet, but it should still have a svelte figure in its retirement years. Not sure if your Greyhound is the right weight? Please refer to the body condition chart provided by Ralston Purina. Strive for number five. As we get older, gravity takes its toll but the Greyhound physique should still be recognizable in an older dog. 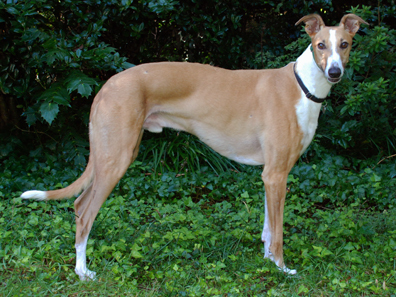 On average, Greyhounds tend to have a low percentage of body fat: 16% compared to 35% in mixed breeds. Barring any medical problems, the major cause of obesity in dogs is overfeeding — primarily treats. Unless your Greyhound has grown fingers and can open the cookie jar, the main reason it’s getting chubby is you: what you’re doing (over feeding) and not doing (not providing enough exercise). The first Greyhound I ever met was a sweet fawn girl who was so obese she looked like a garbage can on sticks. With that long Greyhound head she was a bizarre looking dog. Fortunately I haven’t seen anything that extreme since, but there are many hounds that seem to be wrapped in insulation under their light fur coats. Looks aside, obesity can have undesirable side effects. An overweight dog is a poorer surgical risk and more likely to develop diabetes mellitus, cancer, heat stress, liver malfunction, and other problems. Obesity is a serious complicating factor in canine heart disease. If your dog has sustained any significant joint injury to its extremities, on or off the track, traumatic arthritis can result and will be aggravated by increased load bearing on the joint. Degenerative arthritis that develops in an older dog will also be aggravated. If your Greyhound seems to be a bit thick in the middle, look at what you’re feeding him/her. How many treats per day are you giving? What size and how many? Is the lunch biscuit almost as big as a meal? Maybe you need to cut back to fewer smaller biscuits. How many table scraps do you give? A whole slice of pizza? Don’t kill the dog with kindness—just a little bite will do. Has your dog trained you to feed him or her from the table? Look at how much you feed your dog for breakfast and dinner. Some people don’t even measure. You may need to cut back the amount you feed for the main meals. How much you should feed depends on the brand of food, height of the dog and activity level. Talk to your vet about your dog’s weight. The vet may recommend a specific dog food or even run tests to see if a medical condition is causing weight gain. Raw vegetables can be good low-cal snacks but don’t overdo. Be especially careful with older dogs and any dogs that show signs of reduced kidney function. The high phosphorous level in veggies can be very detrimental to impaired kidneys. I’ve seen a video of an Irish racing Greyhound training on a treadmill, but the most practical thing for most of us is to just go out for a walk. Most dogs and humans can benefit from an exercise program of brisk walking. If your Greyhound is really out of condition, start with a 10-minute walk when the weather is cool and build up to a comfortable level. If you will be walking on a paved surface, the toe pads have to acclimate as well. The dog’s nails may need to be clipped, as they should not touch the ground when standing or the toes may splay. The walks will help the dog’s cardiovascular and musculoskeletal systems as well as stimulate its mind, and your dog will have a great time sending and receiving pee-mail. I still remember the man who took care of his friend’s Greyhound and was anxious to know why the dog was totally exhausted after he’d take it for daily two-hour walks. The breed was not designed for this. We all look forward to our daily half-hour walks here and I know it keeps our four dogs trim. During the November deer-hunting season, we can only romp in the woods on Sundays and we are apt to pack on the pounds unless I cut back on the food a bit or we go to the park. Although we have an acre-and-a-half fenced yard, what the dogs do in it isn’t enough to keep them in shape. One benefit of putting your dog on an exercise program with you is that it can help your cardiovascular system and raise your good cholesterol (HDL). It works for me. Now, if I could only keep my hands out of the potato chip bag, I’d be as trim as my Greyhounds. Barnes, Julia, Ed. The Complete Book of Greyhounds, Howell Book House, 1994. Carlson, Delbert G., DVM and Giffin, James M., MD. Dog Owner’s Home Veterinary Handbook, Howell Book House, 1980. Gearhart, Martha A., DVM. “Managing a Renal Crisis,” DogWorld, April 1997. McGinnis, Terri, DVM. The Well Dog Book, Random House, 1991.